Lokrum Island is only 10 minutes by ferry from Dubrovnik’s Old Harbor but manages to completely leave the city behind. The noon sailing was packed and we sat on the boat’s edge looking down over the water. Sea cliffs and abandoned parts of the fort. Lokrum is protected as a forest reserve and holds a few ruins – it was once home to a monastery and a fort was built on the highest point in the 1800s. Now, however, legends declare the island is haunted and no one is allowed to spend the night. Around Lokrum – lots of shore plants and tidepools. The main attraction is wandering around the island itself. That, or paying too much for food and drinks at one of the cafes. We spent our four hours exploring trails and crumbling buildings. The highlight turned out to checking out tide pools where jagged sections of limestone vanish into the sea. The cracks in the rock wear down much faster than the surrounding stone and make interesting (and photogenic) pools and channels for sea creatures to hide in. Fish and small crabs were the most lively occupants. I was hoping for starfish, but didn’t manage to find any. Fort Royal’s interior, Dubrovnik through the trees. Much of the monastery was off-limits for restoration, but a small museum in its wings remained open. It houses a replica of the Iron Throne. We took all the requisite pictures of ourselves seated in it trying to look kingly and evil. Fort Royal, built by Napoleon’s troops, is now surrounded by trees blocking some of the view. Still, from the top of the tower we could see most Dubrovnik’s walls and miles of mountains sloping down to the Croatian coast. A pointy chair fictional people are always fighting over, cave along the shoreline, bunnies & fire hoses. The most crowded spots were the cafes near the port and the fortress. Walking a few minutes down any forest trail let us escape from other tourists. The quiet of the island was a welcome relief after the cramped feeling of the Old Town, even though we could hear jet skis and some especially loud motorcycles on the mainland highway. Parts of the island were full of pine trees, and it almost felt like hiking in eastern Washington and smelled a little like Christmas. Unlike the mainland, there seem to be no cats on the island, but bunnies and peacocks were released at some point and have taken over the lawns by the restaurants. While the rabbits are cute, the peacocks scream too loudly and too much. Fortunately, they do not like the brushy parts of the island and it’s easy to avoid them. Fire hoses were also strangely common. Fire danger on the island was very high (despite rain in the forecast) and there is no underground water system, so this is the best way to respond quickly to any flames. We picked a warm day with lots of sun to walk around Old Town on top of the walls. Basically everyone we asked about Dubrovnik said this was the one thing we needed to do. It has all the benefits of clambering around a castle, hiking, and sightseeing in one. Now bursting with tourists (and tour companies handing out flyers), the Pile Gate was clearly built to be intimidating. A wide moat is crossed by drawbridge leading through stone walls at least fifteen feet thick. The gate itself is intensely fortified, towers stand on each corner of the wall and another watches from across a small inlet. Surviving an earthquake in 1667 and sieges all the way into the 1990s, Dubrovnik’s walls took on their current shape by the 1300s. Built up through the centuries, some spots are more than 80 feet high and seem to rise from the sea itself. Commanding views that allowed advance warning of an attack let us admire the city from a different angle. Lovrijenac Fort, looking down, cliff-hugging walls. A hundred or more steps took us to the top of the wall. Church towers stick up, easier to find from above than when wandering around the narrow streets. Almost every structure is made of white stone with a red roof. Many roof tiles are still unweathered – replaced after the 1991-1992 bombing during Croatia’s fight for independence. Lokrum Island, a forest reserve, sits just offshore, and other islands and boats dot the water. Precarious boardwalk over construction, flowers left from a wedding, pretty pine, Hobbit-like doors near the sea. We had to come back the next morning to see Lovrijenac, a separate defensive fortress outside the main walls. It turns out you can rent it for events; the afternoon we toured the walls we could see it being set up for a wedding reception. The fort overlooks the rest of the city from a few hundred feet away. Using this rock as a fort goes back at least 1000 years, and it has been reinforced several times with cannons in mind. The view of the Old Town completely encapsulated by its wall is stunning. Old City from Lovrijenac, and the fort’s interior courtyard. Totally aside from the walls, one of the strange things we’ve noticed is feral cats. Our neighborhood in Split had a few that spent most of their time near the waterfront. But Dubrovnik takes it to a new level. A dozen cats seem to be in every quiet corner; they wait outside grocery stores and lounge around parking lots. I’m amazed there are any birds left. Our hosts were kind enough to take us to the Klis Fortress during our last week in Split. 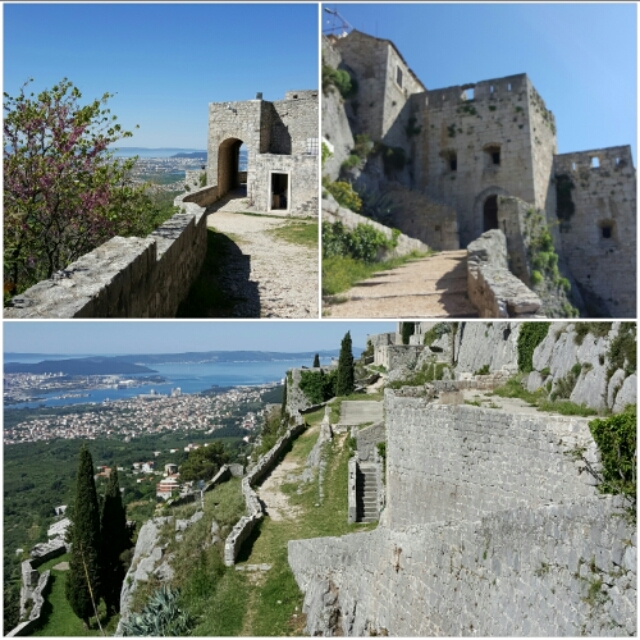 The fortification sits atop a steep hill near Split; we had seen it from the highway as we headed other places. Currently it is a popular attraction not just due to its history, but because it was one of Game of Throne’s Croatian filming locations (along with a few other spots in Split and Dubrovnik’s Old Town). The multiple layers of walls and wide paths that double back on themselves would have made it easy to defend and to stage a TV shoot. The church inside the fortress, looking down at the town of Klis, and then out toward the sea. We also got a side tour of the Roman ruins at Salona just a few miles from Klis. I enjoyed these more than the fortress. We stopped first at the amphitheater. In its heyday it would have had three tiers of seating and room for 17,000 spectators. Thanks to Venetian orders for destruction, only portions of the lowest level remain. A few arches have been preserved and knocked down column are scattered in the weeds. I kept imagining how many ancient plays I’ve read might have been performed there. Salona’s Amphitheater, local wildlife, preserved archways. A five minute walk down the road – apparently a Roman road with some original stones still in place – were a couple of early Christian churches. The smaller church was just a faint outline of stone in a grassy field. The larger church, its baptistry, and its outbuildings were better preserved and their shapes clearly visible. Broken columns were scattered where they fell and I could get a little lost among all the walls that were still taller than I. It was easy to visualize how it might have looked centuries ago. Remains of a 4-5th cent. Christian church. Salona’s ruins are situated in a residential neighborhood; more modern structures use stone taken from the Roman buildings. Homes and yards sit right next to ancient history. It makes it feel almost ordinary.